In the third episode of Rick’s travels, From Venice to Istanbul, he drives from Orebic to Ston. In Villa Koruna he tries native oysters with Marihana Franusic, before heading to Konoba Maris, Trstenik to try what Rick now calls his favourite dish of the journey, black cuttlefish risotto. Rick returns to his kitchen in Symi, Greece to try his hand at recreating the recipe. Next, Rick journeys towards Albania, stopping at the Mrizi i Zanave Restaurant in Lezhe where he meets Altin Prenga and tries pork and beans, flee and chicken jufka, a signature baked dish made with chicken and homemade pasta. After prawn fishing at the lagoon near Lezhe, Rick goes to the Trendafili Mistik Te Diella Restaurant where he tries eels and rice and prawns cooked on wood fire. Jack Stein joins Rick for the next leg of the journey, stopping first at Lezhe Castle and the Statue of Skandeburg, before they go to the Paradise Hotel in Vlorë and try seafood linguine (get the recipe here). Jack and Rick head for the hills next, driving up into the mountains trying to find Albanian shepherds. Finally they find them and try their roast goat and fresh goat cheese. Back in Rick’s kitchen in Symi, he prepares a tave kosi, albanian baked lamb with rice. Lunch at Sofo’s restaurant, near Llogara Pass sees a selection of Albanian recipes including wild mountain herbs and vegetables in filo pastry, breast of lamb stuffed with minced lamb and boiled egg, yoghurt and garlic, baked cheese with green peppers and tomatoes, lamb brains in batter, polenta with offal and kokoretsi: offal wrapped in intestines. After saying goodbye to Jack, Rick muses on Albania’s unspoilt culinary heritage. 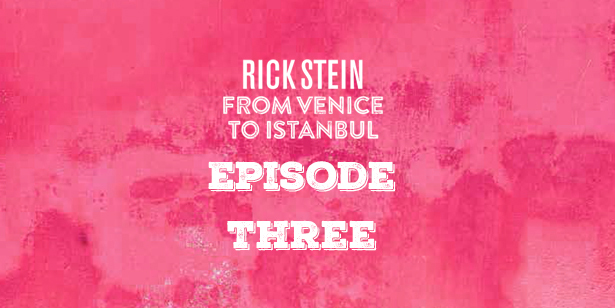 You can find all of the recipes from Rick Stein’s new TV series in his cookery book From Venice to Istanbul, including the black risotto, chicken yufka, lepur çomlek, seafood spaghetti, tavë kosi and kokoretsi featured in episode three of From Venice to Istanbul. Buy it online here. If you liked the look of the black risotto on tonight’s show, book a table at The Seafood Restaurant and try their version made with Cornish cuttlefish here.